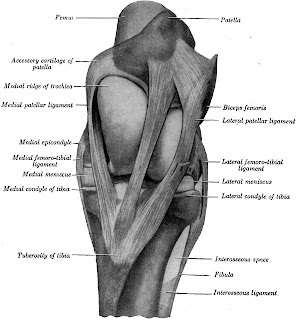 The medial and lateral patellar ligaments attach the patella to the tibia. Short, thick collateral ligaments located on the inside and outside of the stifle joint attach the femur and the tibia. They are not shown on the diagram to the right but can be seen here. The medial meniscus and lateral meniscus are semicircular pads of thick, resilient fibrocartilage. They occupy the spaces between the ends of the femur and the tibia. These pads help cushion the weight-bearing forces in the stifle. Two strong ligamentous bands, the anterior (forward) and posterior (hind) cruciate ligaments, crisscross within the joint and span between attachment sites on the femur and the tibia. You can see them in the caudal diagram link below. Cruciate ligaments provide support for the joint when it is pushed excessively forward or backward. These ligaments also provide some rotational stability. You can see a side view of the stifle here and a caudal (rear) view here. Many vets feel that stifle injuries are underdiagnosed, in part because the stifle is difficult to evaluate. The stifle joint is subject to the same kinds of troubles that other joints/bones might have: OCD, bone cysts, physitis (swelling at the growth plates), arthritis, etc. Traumatic injury to the bones and ligaments are also possible. Activities that involve sharp turns while "digging in the ground" are likely to result in stifle trauma -- in dressage, the pirouette and tempi changes stress the stifle. Cutting and barrel horses tend to have stifle problems as well. Jumping horses can strain the meniscal ligaments. Subloxation of the patella, which locks the stifle in an extended position, is a common problem with horses, especially straight-hocked horses -- but I won't discuss it in depth here. Different ligaments are diagnosed and handled differently. 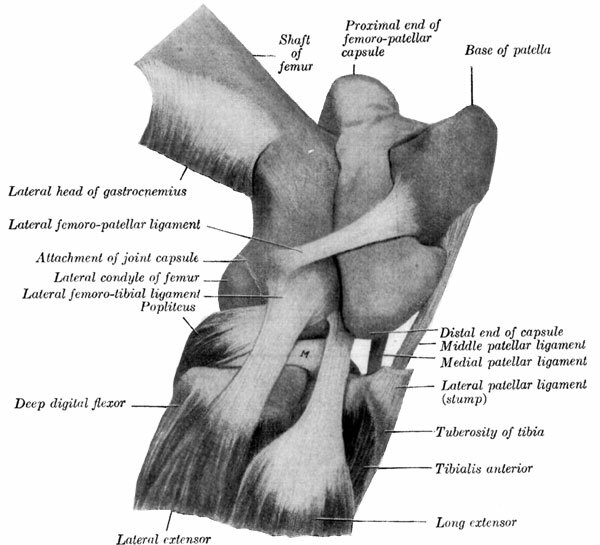 Horses tend to tear meniscal ligaments. Meniscal injuries are found in 10% of all stifle lameness cases. Usually there is swelling and overt lameness. Arthroscopy is the best way to diagnose meniscal injuries, but MRI is becoming more available. Treatment of meniscal damage relies on extended rest, and if you have the money, and injection with Interleukin-1 receptor antagonist protein (IRAP) or stem cells. A meniscal tear should be non-weight-bearing for 60 days, and this is clearly not possible with horses. Surgery is not usually very successful. 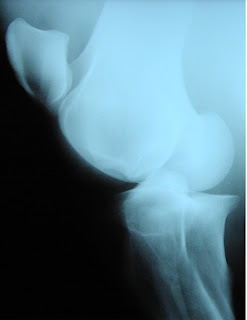 Cruciate ligaments connect the femur to the tibia, and they prevent excessive bending--tears can lead to joint instability. They are easily damaged. Lameness severity tends to mirror the seriousness of the tear. Prognosis for complete tears is very guarded, and even if the tear is partial, only about 50% of the injured animals return to their former level of work. 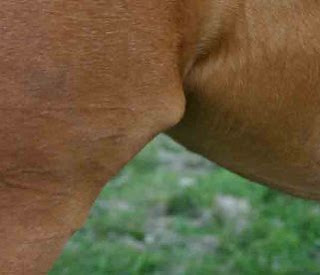 With a collateral ligament injury,lameness may be progressive over several months, and there may be concurrent injury. Diagnostic ultrasound and bone scans are the best tools to identify this problem. These injuries need rest and a slow rehabilitation. Despite careful rehab, most horses have their level of activity limited by this injury. Stem cell therapy might be something to try. Horses with a stifle issue may tend to stand with stifle rotated out. They may put weight on toe while standing or moving, and sometimes the hoof will show excessive wear on the toe. Stifle pain makes the horse reluctant to reach forward with the hind leg, making the stride short and stabby, landing on the toe. The foot flight will stay low to the ground to reduce limb flexion. This causes a pronounced hip hike. Lameness often is more evident when the affected limb is on the outside of the circle. The horse may "bunny hop" annd try to canter when asked to move forward. The horse may be reluctant to go down an incline. A hands-on exam is used to feel effusion, ridges, spurs, and ligament thickening. Anesthesia/blocking of the joints to isolate the source of lameness. Radiographs are often done to detect bony changes, but they can be inconclusive since there are several soft tissue structures in this joint that will not show in an x-ray. Magnetic resonance imaging (MRI) is capable of imaging the stifle provided a horse's leg can be fully loaded into the machine. 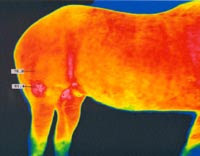 Thermography isn't mentioned a lot as a diagnostic technique, but look at the the picture to the right depicting stifle issues -- downright pretty! Arthroscopy is the ultimate diagnostic procedure, providing the best visualization of the joint interior. The prognosis depends on the severity of the condition/injury, how quickly it is detected, and the form of treatment used. The longer a condition goes untreated, the more likely secondary damage (arthritis, degenerative joint disease, etc.) will occur. Unfortunately, from what I've read, most adult horses do not return to their former level of work. Thanks so much on your article, it had a lot of good information. I ride hunters and equitation but started my riding in dressage. The stifle is a very important piece to the horse and it was good to get some more info on it. Another thank you for your article, it's well written and explanatory. My horse has stifle problems but his vet failed to diagnose it during a rather weak lameness exam. Research of my own is pointing to a collapsing stifle with perhaps cruciate ligament trouble. Is it ok to reference and link this article on my blog? I've been reading this a lot lately with Gus's stifle injury. Thank you! Thanks for this summary. I've just had my horse diagnosed with a stifle problem through nerve blocks. I've now got to decide what next.. do I go for a steroid injection or arthroscope so reading up as much as I can! How has Dauphin's recovery gone? Is he back to work? At what level was he able to return to work? Stifle injuries are so slow and hard to rehab, but patience is the key. Hopefully Dauphin has recovered and is back to work. It'd be nice to hear how he is doing. Please keep us updated. Thank you for your post.